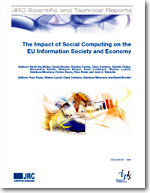 This report examines the socio-economic impact of social computing applications in Europe. It finds that social computing applications has already brought about significant changes which have led to disruptive impacts on industry, citizens, identity, social inclusion, education, health and public governance. The emergence of social computing in the information society scene in 2003 was unexpected. Today, hundreds of millions of users worldwide are using social computing applications such as social networking sites, blogs, collaborative filtering of content, file, photo and video sharing, tagging and annotation, online multi-player games and collaborative platforms for content creation and sharing. The report features a comprehensive empirical analysis of social computing that is intended to inform policy makers. Social computing has both direct and indirect effects on the implementation of the European Lisbon strategy, especially on the post-i2010 agenda currently being drafted. The research has been conducted by the Information Society Unit at Joint Research Center – Institute for Prospective Tchenological Studies over the last three years.